Beer has a long history and well-rooted tradition going back thousands of years. It is the favourite beverage of many – not only in Germany. We have this wonderful “barley juice” to thank for the many anecdotes, idioms and stories that come with this beverage, which, for the most part is brewed with only four ingredients: hops, malt, water and yeast. Beer tastes best out of glass because for one, we can create the perfect head, and second, we all know that what you see is what you get. The shape of the glass determines the relation of liquid to head. Head tastes slightly bitter and of hops, while the liquid tastes slightly sweeter and fruity thanks to the malt. The glass also determines beer flow and speed, and where the beer first touches the tongue. 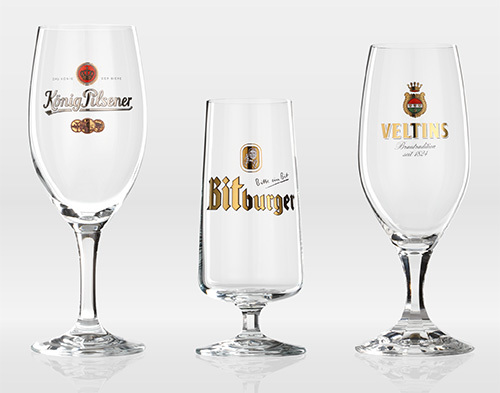 With our expertise in stem glassware, we at RITZENHOFF have developed a great number of different beer glasses – tulip, goblets and tumblers – to do beer true justice and offer well-known international beer brands a unique way to showcase their products. The “cl” information means the volume of the glass brimful.